Featured at the 2011 Los Angeles Film Festival, Terri follows the story of the eponymous 15-year-old (Jacob Wysocki) as he attempts to come to terms with his challenging life circumstances. At the most basic level, Terri’s character can be read as neatly fitting the mould of the classic “social outcast”. He is heavily overweight, lacks any true friends and revels in alone time. But it must be noted that he doesn’t seem to mind that much. Forced to care for his mentally ill uncle (Creed Bratton) in the absence of his parents, Terri is on the brink of becoming completely alienated by the world around him. His grades drop and he starts to wear pyjamas to school every day. 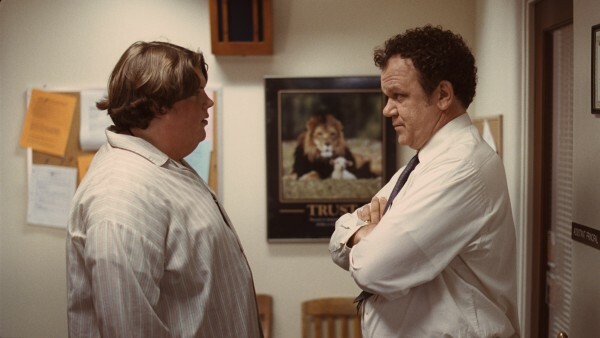 Enter Mr Fitzgerald (John C. Reilly), the principal of Terri’s school, who establishes a unique brand of friendship with the teen. The rapport that develops between the pair is one of the great joys of the film as they quirkily work through each other’s issues. Designed by Julia Shirar and mixed by Eric Thomas, the film’s soundtrack is a lesson in sound spacialisation and is a hub of mediated sonic moments. Set in large part in a school, the film lends itself to interesting and diverse use of sound. Quiet, warm sound environments are repeatedly juxtaposed against those rich with brisk tinniness and ambience. In a general sense, Terri is most comfortable in the quiet spaces. Silence plays a crucial role in the pacing of the film, giving it a “slowness” not unlike its protagonist – a plodder if ever there was one. Not that Terri is unintelligent. The sometimes sparse soundtrack is instead a reflection of Terri’s measuredness and the film’s small town context. Terri’s house: Terri’s home life is quiet, he likes it that way. His uncle James is asleep for much of the time and there’s no one else to be heard talking. This location is returned to again and again and becomes a familiar sonic location. The woods: The shifting gravel of an unpaved pathway, birds tweeting, wind blowing, trees rustling. This is the domain of common sounds of the outdoors, but it by no means “noisy”. For me, these sounds connote the freedom and openness not afforded to Terri at home (he is constantly required to care for his uncle) or school, where his teachers misunderstand his shyness for stupidity. I read this sound space as symbolising Terri being released from entrapment. The school gymnasium: Terri’s state of alienation is most evident during PE class. I loved sports class in high school, but the reverberation and hollowness of the sound in the gymnasium space triggered poignant and negative psychoacoustic connections in me. I hated the space and everything in it. I hated it for Terri as he sits unaffectedly and receives a barrage of verbal abuse from his blunt battle axe of a PE teacher. The sonic environment of the gymnasium is depicted as strange, alien to Terri’s sedentary sensibilities. School Hallways: As with the gymnasium, sound portrays the hallways seen in Terri as being dangerous places. Even the smallest sounds reverberate against the hard, cold floor, walls and ceiling. Mr Fitzgerald’s office: Terri is safe in this office. Speech is not warped and instead “thuds” soothingly and intimately. It is a space where Terri can share things with his primary father figure in confidence, Terri’s “home away from home”. There is an abundance of mediated sound in the film, including speech emitted from a PA system and sounds coming from Terri’s television and record player. Instead of being enjoyed, these sounds are tolerated. The school PA announcements are either ignored by students or borderline inaudible. Terri “tolerates” what he hears (and sees) on television in the absence of other activity options. The kids are bored and these mediated sounds are used in the film to symbolise their collective disillusionment. As seems to be a trend in films that classify themselves as “indie”, the music in Terri is mostly mellow and features acoustic guitar. At least that’s how it felt. There is a marked shift in how I emotionally connected with the same style of music at the beginning and end of the film. I wouldn’t rush to go to this film for its soundtrack alone, but it’s certainly interesting to compare it to films like Goodfellas or Beverly Hills Cop, which both employ “song scores”. This entry was posted in The Modern Soundtrack and tagged Jacob Wysocki, John C. Reilly, LAFF, Los Angeles Film Festival, Terri, The Modern Soundtrack on October 8, 2012 by kitharvey.